Vision therapy is a type of physical therapy for the eyes and brain. It is a highly effective non-surgical treatment for many common visual problems such as lazy eye, crossed eyes, double vision, convergence insufficiency and some reading and learning disabilities. Many patients who have been told, "it's too late," or "you'll have to learn to live with it" have benefited from vision therapy. In the case of learning disabilities, vision therapy is specifically directed toward resolving visual problems which interfere with reading, learning and educational instruction. Optometrists do not claim that vision therapy is a direct treatment for learning disabilities. In honor of our daughter on her 1st birthday we dedicate this website to her for taking us on this amazing journey. This is our contribution to our new family of special friends and children. for you are a tiny miracle, so precious in my sight. from your first steps, to your first tooth, to your first day of school. to love one another, and to always do what's right. so you will see that what I say, is exactly what I do. to count the stars in the sky, and build castles by the sea. attend your special programs, and be proud of all you do. and hang all your beautiful pictures on the refrigerator door. have special birthday parties, and count memories one by one. when you wear a different hairstyle or follow the latest trend. but I promise you, I will be there to do what I can do. "dear precious little child of mine...how did the time slip away." SoonerStart is Oklahoma’s early intervention program for infants and toddlers with disabilities and developmental delays. This program is for infants and toddlers through 36 months of age who have developmental delays or have a physical or mental condition such as Down syndrome, cerebral palsy, etc. Easter Seals Oklahoma is committed to enhance the quality of life for children and adults with disabilities so they may live with equality, dignity and independence. DSACO envisions communities where everyone -- including those with disabilities -- is accepted, included, empowered and given the opportunity and choice to create their own happiness and path to success. The Down Syndrome Association of Tulsa (DSAT) is a non-profit organization that exists to enhance the lives of individuals with Down syndrome, their families and caregivers. This is accomplished by providing support, encouragement, current information, education, opportunities for socialization and by promoting community recognition of the inherent dignity of all people with developmental disabilities. Early Childhood Special Education (ECSE)--Specially designed instruction for children ages 3 to the age of public school eligibility including physical, speech/language, mobility, social or emotional, and others. Easter Seals Oregon provides exceptional services to ensure that children and adults with autism and other disabilities or special needs and their families have equal opportunities to live, learn, work and play in their communities. Their mission is to promote a positive understanding of disability and community inclusion, as well as be a source of support, information, and education for families and professionals. CODSN will accomplish this mission by empowering and supporting families and individuals who have been touched by disability. We will work to increase education, promote public understanding and acceptance, and encourage full inclusion of individuals with differences in our community. In 1979 a group of parents whose children had Down syndrome formed an organization called the Down Syndrome Parent Association which, in 1993, became the Down Syndrome Association of Southern Oregon. The vision of the founding parents was to provide networking and resources for families and promote positive awareness in our communities. DSASO remains steadfastly committed to enhancing and expanding the lives of individuals with Down syndrome and plays a vital role in providing education, outreach and support to families throughout the entire Southern Oregon region. Down Syndrome Network Oregon is a faith-based support group that provides comfort and acceptance for families, friends and individuals with Down syndrome. It is our goal to use community outreach events to create a vision of hope and awareness to demonstrate that every life brings value to the world. 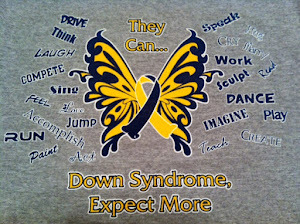 Create and nurture a loving and inclusive community celebrating every person with Down syndrome. The NWDSA will accomplish this mission by empowering and supporting families and individuals who have been touched by Down syndrome. They will work to increase education, promote public understanding and acceptance, work toward full inclusion, and defend the civil rights of individuals with Down syndrome. Their vision also embraces professionals and the cross disability community. Their statement of values is the core of their organization and the basis for how they make decisions to support their mission. They believe that relationships are the cornerstones of their organization and that they should be both honored and nurtured. Self Advocates frustrated by the lack of rural and intercity accessible transportation. Direct Care Providers who receive poor pay for demanding jobs. Case Workers swamped with paperwork and heavy case loads. Families and Individuals who feel policy making does not reflect their needs. And many others with individual concerns and issues. What they hear shapes what they do. Every five years they build a strategic plan based on what they hear from you and the issues facing families and individuals. The plan focuses their efforts in areas where they can be most effective and produce positive results for the largest number of people. The Arc of Oregon, together with its network of members and affiliated chapters, advocates for the rights and full community participation of all children and adults with intellectual and developmental disabilities. Currently Easter Seals South Dakota serves in excess of 10,000 children and adults each year, with the number served climbing each year. Children and adults with disabilities and special needs find highest-quality services designed to meet their individual needs when they come to Easter Seals. Whether through a birth condition, injury or illness, or because of functional limitations experienced in aging, Easter Seals South Dakota, services are the first step toward helping people with disabilities gain greater independence. Description: This Clinic provides comprehensive services in the areas of diagnosis, prevention and management of genetic disorders and birth defects. Care is provided for newborns, children, adolescents and adults with concerns about any form of hereditary disorder. The clinic is staffed by a board-certified geneticist, Dr. Laura Davis Keppen, a board-certified genetic counselor, a registered dietitian, and a registered nurse. The team provides genetic services including diagnosis, evaluation, counseling, and management of genetic and congenital conditions. Description of clinic: This Clinic provides comprehensive services in the areas of diagnosis, prevention and management of genetic disorders and birth defects. Care is provided for newborns, children, and adolescents. The clinic is staffed by a board-certified geneticist, a genetic counselor, a registered dietitian, a social worker, and a registered nurse. The team provides genetic services including diagnosis, evaluation, counseling, and management of genetic and congenital conditions. New Direction's mission is to provide information about Down syndrome, direction to resources, and networking opportunities. New Directions strives to enhance the lives of individuals with Down syndrome throughout their lifespan by providing support, information and education to those individuals, their families, and professionals. New Directions also seeks to provide the entire community with information and education to broaden awareness and foster positive attitudes regarding individuals with Down syndrome. Tennessee's Early Intervention System is a voluntary educational program for families with children ages birth through two years of age with disabilities or developmental delays. The primary goal of EI is to support families in promoting their child’s optimal development and to facilitate the child’s participation in family and community activities. The focus of EI is to encourage the active participation of families in the intervention by imbedding strategies into family routines. It is the parents who provide the real early intervention by creatively adapting their child care methods to facilitate the development of their child, while balancing the needs of the rest of the family. You may make a referral to TEIS by calling 1-800-852-7157, calling the office directly (TEIS SPOE Contact Information ) or by contacting Robin Crutcher at 615-253-2589 or by email. If emailing, please write "referral" in the subject line. Please provide your name, contact information, child's name, date of birth, county the child lives in, parent information (if someone other than the parent calls) and the developmental concern when making a referral. A service coordinator will make several attempts to contact the parent within five days of the referral by phone and by mail. The mission of Easter Seals Tennessee is to provide exceptional services to ensure that all people with disabilities or special needs and their families have equal opportunities to live, learn, work and play in their community. CHATTANOOGA DOWN SYNDROME SOCIETY is made up of people who have Down syndrome, their family members, and others who care about them in the Chattanooga region. They were formerly known as UPPs (United Parents and Professionals) for DownS, although they changed their name a few years ago to become more easily accessible. They offer periodic mini-conferences on issues pertaining to Down syndrome, send out a newsletter, and also sponsor social events for their membership. Began in 1973 as Down's Parents of Memphis. A small group of parents met while attending the first Early Intervention Program in Memphis at the Child Development Center. They began meeting to learn more about Down syndrome and to work to improve public awareness, while providing the most current care for their children. This group of parents went on to begin the early intervention program now known as Special Kids & Families. Down Syndrome Association of Middle Tennessee (DSAMT) is the definitive resource in Middle Tennessee for accurate andup-to-date information on Down syndrome and a community resource for self-advocates and their families, educators anddisability professionals. The Down Syndrome Awareness Group of East Tennessee (DSAG), a volunteer-led 501(c)(3) organization, is a parent-initiated organization developed to provide information and support to families of individuals with Down syndrome (DS) and to raise awareness within the community about the abilities of individuals with DS and the benefits of their inclusion into society. Our vision is to enhance the quality of life for people with Down syndrome and to increase knowledge and acceptance in the community. IDSC for Life is dedicated to serving individuals with Down syndrome from conception throughout their lives. We will achieve this by supporting families who have been given a prenatal diagnosis of Down syndrome. We direct families to accurate and up-to-date information about Down syndrome. We extend our heartfelt compassion, and hope and healing to parents who who were pressured to terminate, and ended their pregnancy because of a Down syndrome diagnosis and later regret that decision. The Arc Tennessee advocates for the rights and full participation of all people with intellectual and/or developmental disabilities. Through our family-based network of members and chapters, we support and empower individuals and families; connect and inform individuals and families; improve support and service systems; influence public policy; increase public awareness; and inspire inclusive communities.